"A Drug Free World" is a propaganda arm of Scientology, promoted as a drug prevention and drug education program. It campaigns for the elimination of drug and alcohol abuse and refers addicts to the Narconon program. Like Narconon, many health professionals are critical of this campaign due its non-evidence base and unsubstantiated claims. In addition to campaigning against recreational drug use, it also campaigns against medical drugs used for mental health treatment . Names associated with this campaign include Drug Free Ambassadors Australia, Drug Free World Australia, Truth About Drugs, Foundation for a Drug Free World, Drug Free Marshals, and Drug Free Education. Drug Free Ambassadors Australia Incorporated is a registered charity with ACNC , established 1 Jan 1993. Drug Free Ambassadors Australia hand out the Truth About Drugs booklets at markets, fairs, sporting events, etc, and do mail-outs to schools, police, community groups and residents. They also conduct education seminars. Its link to Scientology does not appear in any of its printed material and there is only a single mention of Scientology on its website (and not on the main page). 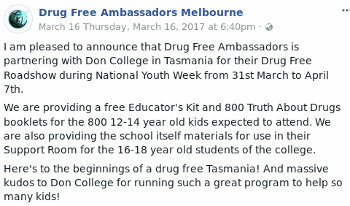 On 16 March 2017, Drug Free Ambassadors Melbourne announced a partnership with Don College in Tasmania for a Drug Free Roadshow where it would be distributing 800 Truth About Drugs booklets for 12-14 year old children, and also providing materials for the school to use for its 16-18 year old students. Wimmera for a Drug Free World is a local chapter that commenced in April 2016. 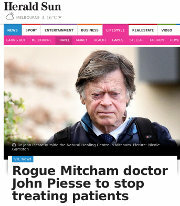 It covers the Wimmera region of Victoria and is run by scientologists Josephine Beats and Amanda Beats. It is a very active group, sending out The Truth About Drugs booklets to Wimmera residents, police, community groups and at local events. It publicly launched in May 2016 with the article Wimmera drugs education: new group aims to tackle illicit use , The Wimmera Mail-Times, 24 May 2016. 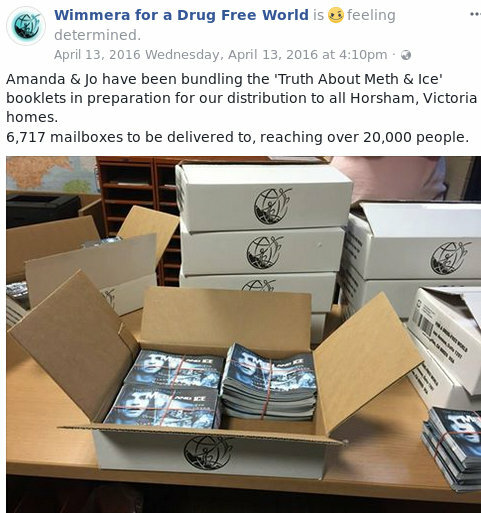 "Amanda & Jo have been bundling the 'Truth About Meth & Ice' booklets in preparation for our distribution to all Horsham, Victoria homes. 6,717 mailboxes to be delivered to, reaching over 20,000 people." "We had a super successful weekend handing out over 14,000 booklets to the public of the 2016 Grampians Grape Escape festival in Halls Gap. Huge thanks to all of our volunteers over the weekend. We met with event management David, Amber & Will who were extremely accommodating and supportive. Not to mention the police of Halls Gap & Stawell who took booklets by the hundreds for their own distribution. We were approached by many community members such as lecturers, teachers, council members, aboriginal rights members and more… It's safe to say our work is cut out for us!! 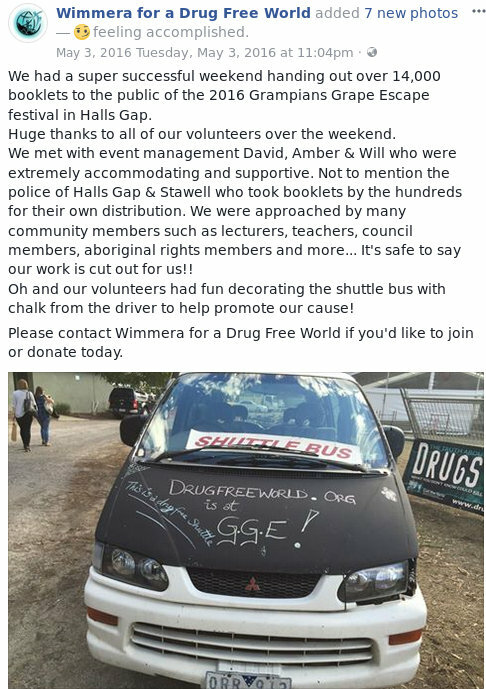 On and our volunteers had fun decorating the shuttle bus with chalk from the driver to help promote our cause! Please contact Wimmera for a Drug Free World if you'd like to join or donate today." 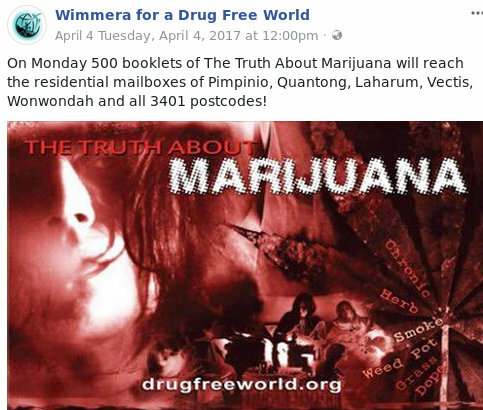 "Wimmera for a Drug Free World has supplied the Police of Horsham, Stawell and Halls Gap 100s of booklets for their own use, distributions and display in their stations. The police were very keen to get their hands on our booklets to help the[sic] educate our locals." 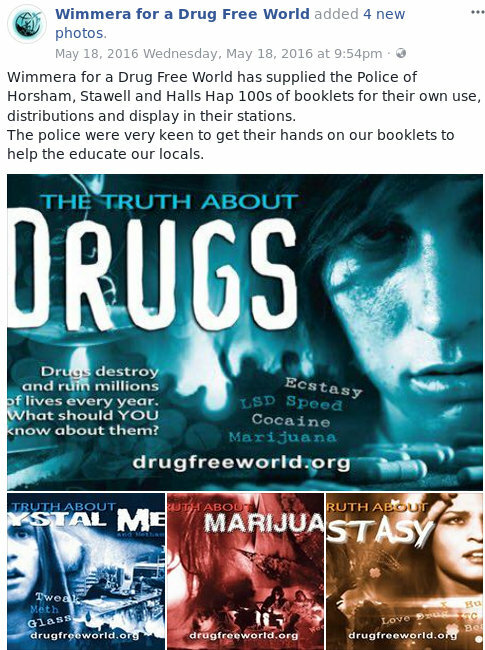 "On the 31st of May, Horsham residents would've received their 2nd copy of The Truth About Meth & Ice booklet. Thanks to all our donators!" "We have been distributing The Truth About Meth/Ice booklets to Horsham residential mailboxes on a weekly basis." 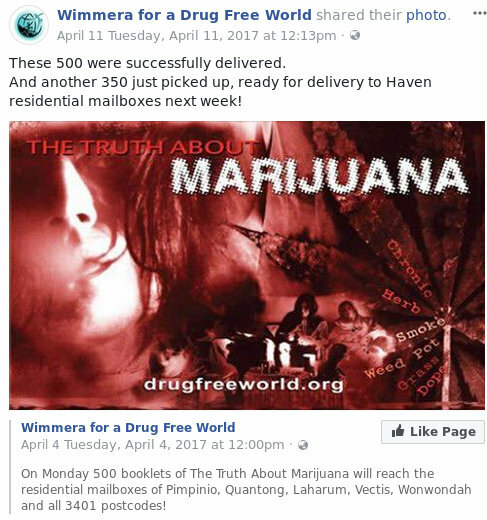 "On Monday 500 booklets of The Truth About Marijuana will reach the residential mailboxes of Pimpinio, Quantong, Larahum, Vectis, Wonwondah and all 3401 postcodes!" "These 500 were successfully delivered. And another 350 just picked up, ready for delivery to Haven residential mailboxes next week!" The state-owned Victorian organisation, Vic Forests, has published a drug information booklet that contains a lot of information sourced from A Drug Free World. Refer VicForests Alcohol and Drug Information Kit (pdf). There is no mention of Scientology in the Truth About Drugs material. Videos and booklets can be downloaded from the Foundation for a Drug-Free World website.